Well, this is my first attempt at doing a race recap, so please bear with me as I stumble through it. This was my first Rock N’ Roll event and I’ve heard a lot of horror stories about what to expect from this weekend. 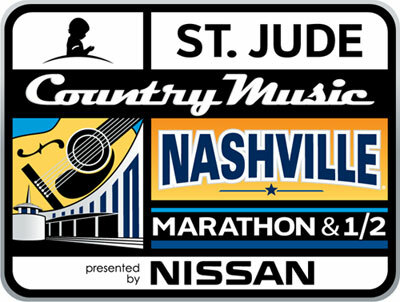 Anna, my daughters Emma & Abby and I arrived in Nashville on Friday, April 27th around 1pm, got checked into our hotel in the Vanderbilt area, which was right at the start line of the race. We then headed downtown to the expo. We made the mistake of driving. You could not find a parking spot anywhere, so we headed back to the hotel and caught a cab which was definitely the preferred method of transportation that weekend. We arrived at the expo around 2:30 and it was already very crowded, but it was also very organized. I was able to pick up my bib and SWAG right away. I made a corral change to sync with new running goal of 3:20, which ended up bumping me from Corral 4 to Corral 2. 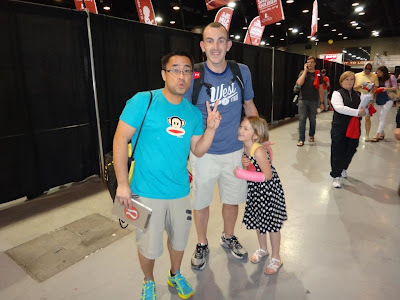 At this point, I recognized a very popular marathon runner, Dave Mari and introduced myself to him. Seemed like a very cool dude. He runs a ton of marathons and always wears Paul Frank shirts. He was easy to spot and I was glad for the chance to say hello. We were then funneled into the Brooks Souvenir Area along with Brooks Clothing & Gear. I was very impressed with the selection of merchandise that was available. I thought it was even better than what I had seen at Disney races, which was my gold standard. They also had a carnival setup that my kids really enjoyed because it had games such as ski-ball and a carnival barker type shoe. Anna allowed me to go onto the expo floor while she watched the kids. What is a mall to most women is what an Expo is to me. Of course, I already knew some of the things I wanted. I made a beeline to the Nite Beams Tent and got a couple of Arm bands to go along with the ankle bands I already own (nothing like looking like a Christmas Tree when you run ), and I then immediately headed to the Swiftwick area and picked up some more socks. I then returned back to the Brooks souvenir area and purchased a Shirt, jacket, singlet and a magnet. We later met up with our good friends the Ortega’s (Roger-who was running the race with me, Evelyn and their kids Gabby, Bella & William) and headed out to dinner. Downtown Nashville was packed. Every restaurant was just slammed at 6:30, which was a little later than I had wanted to eat, but we then found this great little Italian restaurant with no one in it, Sbarro . Isn’t that everyone’s idea of a great pre-race meal? Well, not any of ours, but with tired and hungry kids, it worked for all of us. When we finished the meal, it was time to head back to the hotel room and hope for a goodnight’s rest. I was able to get a decent night’s rest. Woke up a couple of times, but being right at the start line, I got to sleep till 5am CST which felt like 6am to me because I’m on EST. I had my normal pre-race meal of a bagel and a powerade. I got to hang in the room till about 35 minutes before the race which was extremely nice. No lines for the bathroom, NO PORT-A-POTTY and a nice comfortable chair or bed to sit on. I said my goodbyes to my wife and daughters who wished me good luck, and off I went. Roger was running a little late, so we decided to just try and find each other in the corral since we were in the same Corral and planning on running the same pace. At about 30 minutes before the race, I did my first of two Five minute warm up sessions. I just ran behind the hotel and parallel to the starting corrals and got my pace to about within 45 seconds of my race pace. After the first warm up, I stretched pretty well. I was already taking notice of the weather and how similar it was to my last marathon, the Georgia Marathon. It was already in the mid 60’s and the sun was just starting to rise and there wasn’t a cloud in sight. Definitely not the weather I had hoped for, but at least I thought I knew what to expect since I had been through it before just over a month ago. About 13 minutes before the start of the race, I did my last warm up where I got my pace to within 10 seconds of my race pace. After that warm up, I proceeded straight to Corral 2 where I was able to find Roger in no time. Now it was time to listen to the national anthem and kick this thing off. For this race, I had purchased a pace tattoo from tazrunning.com which gave me mile by mile paces that would adjust slightly for the hills and get me to the 3:20 finish time. I definitely had done my best training up to this point. I had a bigger base of mileage and was not limping into this marathon like I was the Georgia Marathon. I was ready. I was confident. I was naïve. The first Corral went off a minute before ours did, so we had some breathing room. Right from the go, we had plenty of room to run and we were able to get off to a good start and settle into our pace. As usual, it was tough to not run faster because we were getting passed by a lot of people, but I made it a priority to keep my pace as close to my suggested pace tattoo as I could. We were usually within 2 seconds of it for the first 20 miles. Roger was running beside me, and I could tell he was amped up, because I continually had to slow him down. The course was very rolling to begin with. We pretty much started on a downhill trend the first 2 miles, so slowing down was the key for us. This was the scenic part of the course. We were headed directly into downtown and could see the skyline. My parents, brother & sister had come out to support me and were somewhere around mile 2, but I couldn’t see them with all the other runners around me and all the people cheering us on, but we did manage to see Roger’s wife Evelyn and his kids. Miles 3-5 were some of the toughest, at least hill wise, of the course, we gained 239 feet and only lost 61 feet during those miles. During these hills, we ran through Music Row and on beside Belmont University. When I run, I really don’t pay a heck of a lot of attention to my surroundings because I’m always thinking ahead about the next mile and monitoring my current pace. After the hills section, this was probably the easiest section of the course. We only climbed 98 feet while we descended 227 feet. If we were a little fast anywhere on the course, it was here. I had to put the brakes on just a few times to get us slowed down close to the pace we needed to hit. It just felt super easy. The sun was out in full force now and it was definitely warm, but at this point, I didn’t feel affected. The course narrowed for a short portion of this stretch as we turned around to head back toward Belmont. This was the only point on the course where I felt crowded and unable to run our pace, but it only lasted a few hundred yards, and we were able to get by a few people that were bottle necking things up. We were now starting to pass several people in chunks. We were just keeping to our pace, but also, noticing that the sun and the heat were starting to take its toll on some that got out to a fast start. At this point in the race we were still mixed in with the Half Marathoners. We were even starting to see a few walkers, which seemed way too early. During mile 10 we were able to spot Evelyn up on a bridge cheering us on and taking pictures. Right after that, I saw my family for the first time. I was excited to see them. Always good to see a familiar face cheering you on! So far, so good. Roger and I are continuing to pass people during this stretch. We finally split off from the Half Marathoners at about the 11.5 Mile point and settle into a boring out and back stretch of running. The sun was definitely becoming a factor at this point. We were still running strong, but there was absolutely no escape from the sun or the heat. At least in the Georgia Marathon, we had good stretches of shade. Up to this point, we had very little shade. We were exposed. After the split off, it thinned out nicely for us. We were able to see the leader coming back at us while we were on Mile 12 while he was on mile 15. I was kind of surprised we were that close to him. I was expecting a bigger margin by then. The leader had a big lead, because it took at least a minute it seemed before we saw the next person. During this stretch we gained 199 feet and lost 199 feet. A complete wash, but it seemed to be long stretches of uphill and downhill. After the turnaround to head back towards Nashville, I decided to take the favorable angle directly in the sun versus running wide to the sidewalks and hitting the sparse shade of a single tree every so often, which most others were doing. We were still passing people at this point, and no one seemed to be passing us. During the Georgia Marathon, it seemed like you ran with a group of runners during this stretch, and all stayed about the same pace. It wasn’t the case this time. We were running faster than most. This to me seemed to be the hottest point on the course, but I was still feeling pretty good at this point. On the coming back portion, we were able to see all those behind for the first time which was a lot more than our side of the road. Looking back at this stretch, this was probably the most critical stretch of the race for me. I entered this stretch feeling pretty good. I was even thinking that I might be able to pick it up the pace the last 6 miles. Then the next set of hills hit, and it was a deal breaker. During this stretch, we climbed 282 feet and lost 258. I was once again able to see my family around Mile 17 cheering me on. That was really nice, because it was coming off a big hill. The cruelty of this course comes to play during this stretch. We actually meet back up with Half Marathoners, but are separated from them and then we are forced to run by the finish line and see the halfers finish next to our finish line. We still had another 9 miles to go. For some reason, I believed this section of the course was going to be flatter than what it was. Roger was definitely running stronger than me. I was starting to feel the fatigue and the heat getting to me after the 96 foot climb on Mile 18. We were still hitting our pace up to this point, but around mile 19, we climbed another 34 feet, I was starting to struggle to keep the pace, but was managing. I kept hoping for a big downhill, and we got it at Mile 20 with the 81 foot descent, but I fell behind my pace for this first time, only by 1 second, but it was a struggle. To top it off, I started to feel my right foot long toe starting to hurt. I knew the fun was about to begin. Mentally, I was beat at the start of mile 21. I told Roger to go on, and finish his race at his pace and that I wasn’t able to keep up. Right after Roger pulled away from me, my Garmin went flying off my wrist. I have a defective band and a new one has been sent to me, but it didn’t make it before the race unfortunately. The pin had slid off causing my watch to fall to the ground. I immediately stopped, went back to get it. I tried running and holding the watch, but that was a pain. I tried putting it in a pocket, but that too was a pain. So I just slowed down and walked again and was finally able to get the pin back into the band of the watch and wear it again. What a complete pain. Once I stopped running, it was extremely hard to get going again. The final elevations resulted in us climbing 88 feet and descending 95 feet. We were out by a golf course and park area. Definitely the loneliest part of the course which really stunk, because I could have used the support at this point. Oddly enough, with me stopping to walk, I didn’t get passed by very many people. At this point, I could see people ahead of me just completely falling out and needing help. I was mad at myself for walking, because I was running a clock in my head and seeing my time plummet yet again in my 2nd marathon. At mile 22, I lost sight of Roger. I got out the jolly ranchers I had brought hoping they would help. I was starting to play leap frog with several runners. I would pass them and then I would stop to walk a little ahead of that, and then they would pass me. This went on for about 3 miles. During mile 24, I met up with one of the guys playing leap frog with me, and talked him into trying to finish this thing together. I knew that my original time goal was shot, but coming in under 3:30 was still possible. So we made it a plan to walk through the water stations and run the rest. We were both able to do this till the last climb at the start of 26. My toe was throbbing at this point. I had no idea what was wrong with it, but it was hurting. I walked for about 50 yards, and then I ran the last ¾ mile into the finish. At this point, we started to see the crowd again and it gave me a sudden rush of energy to finish this thing. I was able to cross the finish at 3:29:37. A new PR by over a minute, but I was deflated. I was so disappointed and completely exhausted. I saw the guy that I tried to finish in with the last 3 miles and we congratulated each other. It was only a few miles, but it was good to have someone to try and run with. Roger was right there to greet me after I received my medal. It was really good to see Roger again as I was so disappointed I couldn't keep up with him. He apparently hit the wall at Mile 22, but was able to finish in a great time of 3:23.He has improved every marathon. Very fun to watch him get better. Now I just need to do the same. My parents immediately found me and started walking parallel to me in the finish chute area. By the way, Chocolate Milk is an AWESOME drink to have right after you finish a marathon or any race in which you are spent. I had to go lean on a fence for a few minutes and get my bearings and bid Roger bye as he went to go find his family. I burned over 3,600 calories, so I was completely starving and they had plenty of bagels, which does wonders for me in a quick hunger fix. I was scarfing a couple of those up while leaning on the fence and talking to my parents. I then head out and found Anna. She gave me a huge hug and that was awesome. I definitely needed that. I sat down and started to change socks and shoes and found out that my foot was throbbing because my long right toe was extremely bruised and the half the nail had popped off. Ouch. When we finished, I think the temperature was in the low 80’s at this point. The sun, heat and high humidity absolutely beat me down. 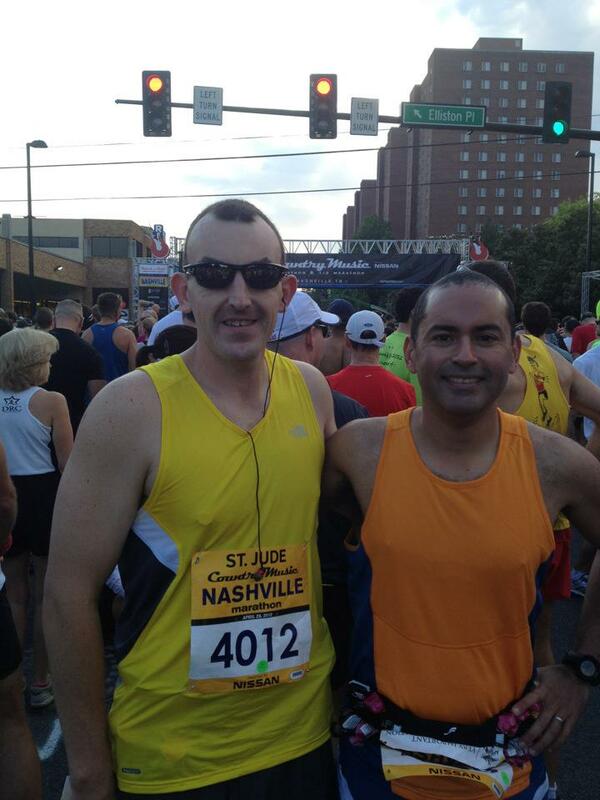 At the time, I was excited to have finished my 2nd marathon, but frustrated that I had not done better. Now that I have had a few days to reflect on it, I feel much better about what I did. No, I wasn’t able to keep up with my running buddy, but heck, I’ll attribute that to the extra 30 IB’s I have on him. He is definitely built for endurance running better than I am at this point. It takes time after disappointment to realize what you actually accomplished. I ended up finishing 128th out of 3,928 finishers. I know I did well. I also know that, at least according to the race reports I’m seeing, that most everyone was off by several minutes of their goal time. I have also learned to respect the distance. They don’t call it a marathon for just any reason. It’s because it is hard. It challenges you physically, but maybe even more mentally. I do believe that I lost it way more mentally than physically. The foot / toe was hurting, but I believe I was looking for a reason to stop and take a walk break. It didn’t hurt to run. My muscles didn’t cramp up. I was mentally exhausted. I now know that the next race I do and if the weather is the same, I need to adjust my plans slightly. I should have been shooting for a 3:25 instead of a 3:20. I think that would have made a difference in how I felt. I stayed way too aggressive. I’ve now run 2 marathons, and I have a handful of lessons to take away from them. I have a feeling my 3rd will be no different. Thanks for staying with me through my novel of a race report. Sorry for the length. Trying to present a clear picture of what I can recall from that day. Time for me to just build up and improve upon my current running base. My next race of any distance isn’t until the Rock N’ Roll Chicago Half Marathon in July. I thought, at least from my experience, that the Competitor Group did a very good job of managing the 30,000 runners that showed up for this event. I didn’t have the terrible experiences that others have had in the past. Of course me starting in Corral 2 vs someone that started in Corral 32, may have had a totally different experience. Everything seemed to go smoothly. The only two issues that I had, and they are minor, is that they originally ran out of beer at the Runner’s table and they could improve the strap that the medal goes on. The medal is very nice, but the strap is very cheap. They could do better there, but you know I’m stretching to complain if that is all I could come up with. I have two more Rock N’ Roll events this year, so I’m sure my opinion might change.